In 2011, Nantong Economic and Technological Development Area adhered to the recommendations of the Scientific Outlook on Development, speeding up the transformation of development modes to further intensify technological innovation, and as a consequence achieved new results in industrial development, platform construction, project application and policy improvement. It won 40.62 billion yuan from the high-tech industry in 2011, 39.4 percent of the total industrial output values of scaled enterprises. It was allocated over 47.47 million yuan in funds in support of scientific research projects at the provincial level and above, the leading recipient in the city. Nantong Economic and Technological Development Area applied for 4,214 patents, and won 2,685 patents including 99 invention patents, the highest in the city. The development zone was evaluated as the first by Party and government officials facilitating technological progress in the city in 2011, a good start for scientific and technological growth during the 12th Five-year Plan period (2011-2015) and contributing to economic transformation and upgrading. I. Intensify programming guidance to improve overall innovations. According to Jiangsu provincial and Nantong municipal outlines for scientific and technological progress and the provincial and municipal documents on technological innovation in the 12th Five-year Plan period, Nantong Economic and Technological Development Area has compiled the Scientific and Technological Development Plan of Nantong Development Zone in the 12th Five-year Plan Period. It stipulates that by 2015, the development zone will double its gross R&D investment, high-tech industrial output, research staff, high-tech enterprise, and technological enterprise. The development area aims to quadruple the amount of authorized invention patents and innovation investment scales. Three percent of total output of the development zone will be allocated to R&D; four percent of financial expenditure will be allocated to scientific research; 60 percent of economic growth will be earmarked for scientific progress; high-tech industrial output will account for over 50 percent of the gross industrial outputs of scaled enterprises; 500 authorized patents per 10 billion yuan GDP and 200 applied invention patents per 10 billion yuan GDP will be completed. Meanwhile, the development zone will follow the overall orientation of “5+3+1” plan to construct the industrial park. It will accelerate the construction of the scientific park , and elaborate on the objective of constructing 500,000 square meters of buildings for the scientific park in the 12th Five-year Plan period. It has commissioned China Electronic Information Industry Development Research Institute and CCID Consulting to compile the Program of Nantong Development Zone for Software and Information Service Development. Along with the programming, the development zone has successfully sponsored the conference celebrating the promulgation of State Council No.18 document and the achievements of the Chinese software industry over the past decade. The development zone has been recategorized as Jiangsu provincial software and information service industrial park. II. Strengthen platform construction and improve independent innovation capacity. The development zone has exerted all efforts to improve the technological innovation system with companies as the main body, market as orientation, and integration of enterprises, universities and research institutions. The development area has organized universities and key enterprises to cooperate at all levels, channels and modes. It has intensified efforts to promote specialized research institutions, including company research institutes, engineering technological centers, product development centers and key labs, to accelerate independent innovation. Jiangsu Zhongtian Scientific Research Institute has been appraised as a provincial level company research institute, winning three million yuan for project funding. It is the first in the development zone and the fourth in the city to serve as a provincial level company research institute. The Biomics engineering technology research center has been evaluated as a provincial level engineering technology research center. Zhenhua Heavy Equipment and Baoling Chemical technology center have been authorized as provincial level technology centers. So far, the development zone has a total of 11 provincial level technology centers. Global Steering Gear and Lude Medical have been approved for setting up Nantong municipal level engineering technology research centers, among which there are altogether 29 research centers in the development zone. III. Enhance application organization and elevate scientific project scales and layers. The development zone has widely explored scientific project sources, and encouraged them to make applications. As a result, many scientific and technological programs have been applied for. Expand the scope of national projects. In 2011, the development zone had nine national projects approved. The Biomics microRNA innovation drug incubation base project was listed as a major national scientific project in the 12th Five-year Plan period. The cervical cancer radiologic diagnosis new product cooperative development project was included as a national project for international scientific cooperation. Jiangsu Leading Material Science stem cell regeneration engineering company was approved into the National 863 Plan. Alphay’s edible fungi polyose efficient preparation technology pilot plant test and demonstration project won a national fund for transformation of agricultural achievements. Rehn’s wireless PCEA project won support for national funding for small and medium sized enterprises in technological innovation. The project covers the largest scales and amounts in the development zone. Enlarge provincial projects. Nantong development area has won seven provincial level scientific development projects. Among them, the super-sized full synthesis ultra-low water peak optical fiber prefabricated rod development and industrialization project of Zhongtian Precision Materials, and the inter-tidal and offshore wind power equipment multi-function installation vessel project of Zhenhua Heavy Equipment won special fund subsidies for provincial level transformation of scientific achievements, totaling 16 million yuan. Zhongtian Science and Technology research institute is included in the provincial scientific infrastructures construction program, winning 26.52 million yuan of funding. Improve municipal projects. Zhongtian Hitachi Radio-frequency Cable won three million yuan funding with its high-speed railway shield digital signal cable project, deemed as a major technological innovation project in the city. In a similar manner, Federal Software won 1.5 million yuan funding with the Federal Software IT service comprehensive platform. Nantong Biomics microRNA innovation drug development and industrialization project won the municipal technological talent prize, with an award of three million yuan. IV. Consolidate policy guide to invigorate companies as innovation main bodies. Nantong development zone organized two training programs for application and examination of high-tech companies under the arrangement of the provincial and municipal science and technology administrations and the municipal government. Leading officials of the municipal science and technology and finance administrations lectured on key elements to authorize high-tech enterprises, taxation policies for high-tech companies, and compilation of materials applying for high-tech company status. The development zone extends rewards to companies identified as high-tech enterprises. These high-tech companies are encouraged to make sustainable technological development and achievement transformation, to win independent intellectual property rights, and keep improving core competitiveness. In 2011, the development zone identified seven companies as national high-tech companies, and re-examined seven applicants. The development zone government exempted 24 high-tech companies with 20.74 million yuan taxes, promoting investment in R&D. In accordance with the requirements of the municipal government, the party committee and the municipal science and technology administration on R&D. Nantong development area economic development bureau has organized three training courses for 36 large and medium sized enterprises. Meanwhile, it invited leading officials of the municipal science and technology, and officials from the statistics administrations to interpret relevant policies. As a result of policy promotion, ideological mobilization and business training, companies based in the development zone have become more active and enthusiastic in these policies after recognizing the significance of investment in R&D. The development zone has achieved new progress in R&D investment and statistics operations. In 2011, 129 projects put on the record a deduction in research expenses in the development zone. To support innovation projects and encourage companies to make investment, the development zone adjusted and improved the existing science and technology award policy in March 2011. For the first time, the development zone has integrated scientific and technological projects into the overall assessment of attracting investment. Among the 20 high-tech projects introduced in 2011, 12 fell into the categories of scientific and technological development. Meanwhile, the development zone promulgated Measures of Nantong Development Zone on Management of Funds Guiding Innovation Investment in August 2010. 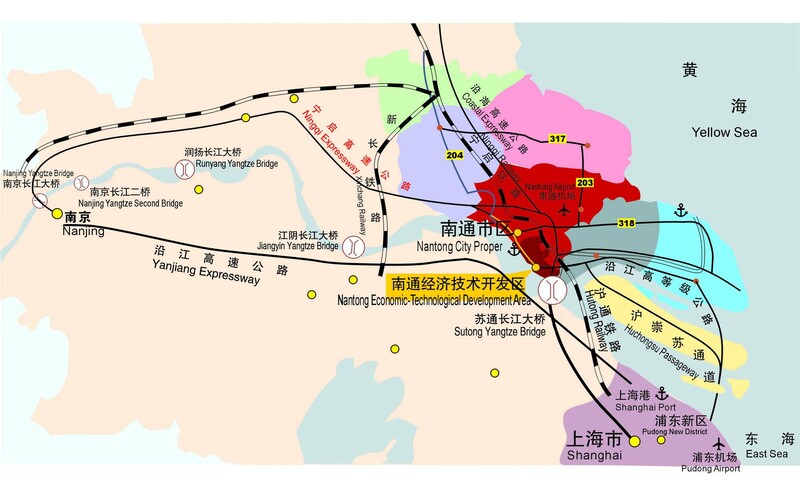 After setting up a government guidance fund of 100 million yuan, the development zone published Several Opinions of the Nantong Development Zone on Encouraging Development of Innovation Companies in May 2011. The new measures elaborate policy support in 10 areas to all sorts of innovation investment agencies. Under support of the municipal science and technology administration, Nantong’s first micro-loan company for science and technology projects, Nantong Rongsheng Science and Technology Small Loan Company was established on August 1, 2011, with the approval of the provincial finance office. It has 200 million yuan registered capital to extend loans or equity investment to small and medium sized scientific and technological companies. V. Intensify economy carrier construction to improve scientific and technological innovation public service capacity. In terms of incubation construction, the high-tech innovation service center has attracted eight project companies, including McCullough Pharma and Shenqi Biology. 18 companies have settled in Nantong. The first stage of Nengda scientific innovation park (innovation outsourcing center), with 63,000 square meters building areas, has started operations integrating technological incubation, innovative design, scientific teaching and development. 22 high-tech projects, including OHO Software, INSPIRY and Huihuan Environment Protection Online Monitoring, have been attracted by Nenda scientific innovation park which has attracted numerous innovation companies and displayed increasingly greater brand influence. All these achievements are due to sound surrounding environments of Nengda business district, qualified office facilities and the efficient business attraction system, and service mechanism of the development zone. In the field of accelerator construction, the development zone has set up a knowledge park, with 100,000 square meters buildings, to integrate new materials, bio-medicines, electronic information and service companies. Fifteen high-tech companies have settled in the knowledge park, including Huidong Automotive Electronics, Rise Pharmacy, AirBlue Automotive Electronics, and Yannan Technology. With regards the industrial park construction, the blueprint of “5+3” plan characteristic industrial parks is being constructed in the development zone, including the Sci-tech Industrial Park, precision machinery industrial park, Medical Treatment & Health Industrial Park, new materials industrial park, equipment manufacturing industrial park, and Nengda business district, Nantong Free Trade Zone, Urban-rural Commercial Zone and Suzhou-Nantong Sci-tech Industrial Park. They will furnish greater development space for industrial incubators and accelerators.